Legal Aid has recently joined AmazonSmile as a recipient charity. 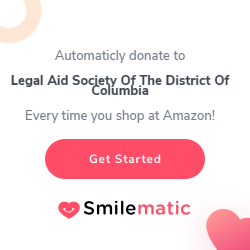 Choose Legal Aid Society of the District of Columbia (EIN: 53-019660) as your charity and AmazonSmile will donate 0.5% of the eligible purchase price to Legal Aid! It’s easy! Next time you shop on Amazon, log in to smile.amazon.com using your Amazon account information, select Legal Aid as your charity, and shop. On behalf of our client community, thank you for your continuing support of Legal Aid.